I got "Memories" finished up today! I worked on it all weekend and I was determined to finish it today! 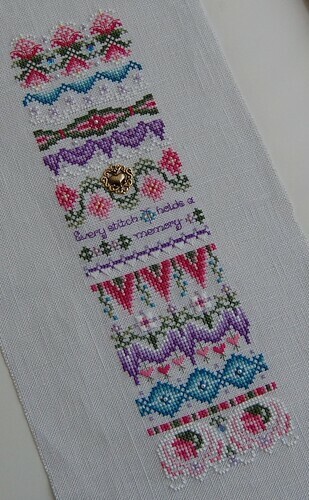 :) I really enjoyed stitching it! We had a nice weekend with my dad and step-mom. The kids had a lot of fun going to the pool and it was so nice to see Deb and her daughter Jessica again! :) I think I've caught the boys cold though. I don't have it too bad, but it's still dragging me down slightly. Write later! This turned out great Nicole! It's nice to hear you had such a good weekend. Hopefully that cold won't get you too bad! "Memories" is very pretty. Congrats on the finish. Congratulations on the finish. It's beautiful. Nicole, its gorgeous. What a great job, and all those bright colors are so summery. Get taking vitamins to keep that cold light. Glad you're home and had a great weekend. Absolutely beautiful! I've added this one to my wish list. WOW Nicole, it's soooo precious and pretty...very dainty, I love it! What's next? Are you ready to start something new? Oh my gosh, that is just beautiful! I love the colors of this one, they are so bright and happy. Also, you take awesome photos which I really love, you can really “see” it that way, it’s hard sometimes not to be able to see it in person. It's beautiful, Nicole - I really love the colors! Congratulations! Memories is beautiful. Such pretty colors. Glad you had a great tim eiwth you family. Stay safe! See you soon!! Congrats on the finish, Memories is gorgeous! Gorgeous finish! I love this piece - the colors are so vibrant and beautiful!